Gopakumar awarded Puduval Kalai Maamani -2004 by Education Minister K.Lakshminarayanan and Poet B.V.Selvaraj I.A.S, Secretary Arts and Culture is all smiles. Music through ages has seen many ups and downs. Many instruments faded away and new ones invented. " During the Sangam age and in 3 rd century A.D the lifetime of Karaikal Ammaiyar we learn through her poems that there existed 21 musical instruments in Tamil Nadu. "Yazh" the prime musical instrument was prominent till 7 th century A.D while Veena slowly captured its prime place. The Veena first found its mention in the Mootha Thirupathigam of Karaikal Ammaiyar and Thirugnanasambandar’s Thevaram. "Yazh " type of musical instruments still exists having emanated during the time of old Greek, Egyptian and Sumerian civilizations. Whereas in Tamil Nadu Yazh disappeared. Vipulananda Adigal who wrote Yazh Nool and Abraham Pandithar who wrote Karunamirtha Sagaram much before him have written how Yazh vanished from circulation but they have not stated why it disappeared and have not cited reasons." Laments Professor A.S.Gnanasambandan, a great Tamil researcher. But P.T.R.Kamala Thigarajan in his book Isai thamizhin Unmai Varalaru had explained valid reasons. On how Veena developed and gained prominence, Dr.V.Premalatha says " From the description it is evident that Veena that was common during the time of King Harsha was an instrument with open strings like the bow-shaped harp. Therefore in the technique of Veena playing in the early stage the plectral technique was developed. This plectral technique by fingers of one or two hands continued till the time of Sarangadeva of 13 th century. It was only after Ramamatya of 16 th century constructed the modern Veena that Veena playing involved both plectral technique as well as manipulation of the strings by the fingers of the left hand". So researchers have explanations on how certain instruments disappear and how new instruments make its appearance and undergo changes during passage of times. In our time we have an innovator in Pondicherry S.Gopakumar who had invented a percussion instrument and named it as Arumughanam. Arumughanam is more or less an Mrudangam but of six individual pieces, assembled together in half circled frame. It is easy to fix or unfix these heads. Out of these six faces one serves as Toppi. In the ancient Tamil musical treatise Koothanool the great scholar of those ages have mentioned about 9 faced Muzhavu. From one to nine faces they had musical instruments, but all lost in ravages of time. 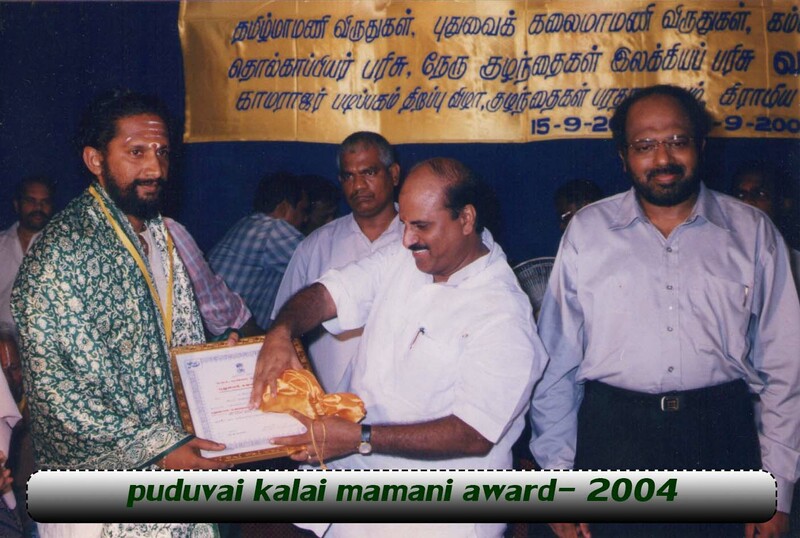 And our Gopakumar, on whom the Government of Pondicherry had conferred the prestigious Kalaimamani award for 2003-2004, had invented Arumughanam earning the praise of scholars. Padma Vibushan Dr.M.Balamuralikrishna in his tribute to the innovator says as follows tracing his ancestry to achievements." It is well known to all musicians of South India that Mullamoodu Bhagavatas were musicians, hereditarily attached to the Royal court of Maharaja Swathi Thiunaal of Travancore, a king among composers. Members of this Mullamoodu family like Thiru Manikutti Bhagavata and Thiru Pichandi Bhagavata continued music as their career, both performing and teaching, they being vocalists, violinists or mrudangists. The latter’s grandson Thiru. S.Gopakumar working as Mrudangam Lecturer in Bharathiar Palkalaikoodam Pondicherry is a good mrudangam player and teacher but also an innovator. I witnessed his recent innovation, a new percussive instrument named as Arumughanam and appreciate his skills, noteworthy," says Dr.Balamurali Krishna.
" This is a percussive instrument with six faces placed on a seat of semi circle resembling the rising sun wit its rays surging upward. On the players left side is the first face, which will be in low pitch. It is being called dommugham because it produces rhythmic syllable "dom". The second face, which produces the syllable "tha", is called thamugham, which raises a high pitch. The musical note madhyama sounded in third face and it is called madhyamam. Fourth face is Tara shadjam, which is known as Dheemmugham because the rhythmic syllable "dheem" is produced. The musical note panchama, the perfect fifth is produced in pamugham, which is the fifth face known as panchamam. Madya sthayi shadja comes out of 6 th face called as samugham. This percussion instrument can be used for solo or can be played with thalavathiyam, classical music and folk music. For both classical and folk dance this can be played with western instruments" says Kalaimamani Gopakumar. Innovations are welcome at all times and innovators need recognition in their lifetime. Thiru. Gopakumar is lucky with Government of Pondicherry Arts and Culture Department Director Miss N.Sumathy encouraging his performances through various programmes in and around Pondicherry while Kalaimamani title conferred recently proves his achievement.